"I was just about ready to stop performing before I came to Square Foot. I was tired of the politics one finds in so many local groups and I was beginning to think that the feeling of really bonding with a cast and crew was something that must go away once you get out of high school/college productions. One of the best decisions I have made in recent memory was to give it another shot and go audition for Square Foot. These people are unlike most others. The cast members seemed to bond overnight and the level of support and camaraderie was nothing short of magical. Jared and Pat have poured all of their love and passion into creating a space where any performer feels empowered to reach and exceed his or her potential. This group deserves all of the support they can get to continue empowering and exciting performers. I truly hope that because of the support they receive, another performer will come in on the brink of throwing in the towel and have their drive reignited too." "After attending a performance of Rocky Horror, I immediately knew that I would have to see all of the productions that Square Foot Theater would feature. Becoming a season ticket holder was an easy decision. I have loved every show that I have seen. The theater, itself, is charming. The entire Square Foot Theater staff is amazing. Every cast I have seen simply exudes talent. So happy to have found such a great place that values the arts. As an advocate for arts appreciation and arts education, SFT has exceeded my expectations of impacting the community in a positive way. I love the mission of the theater company. It really is an incredible organization"
"I have been a part of The Square Foot Theatre Company from a very young age. After over 23 shows with SFT, this community has always provided me with a second home; allowing me to express myself in a strong, meaningful way. School hasn't always been the best environment for me, so to have a place like Square Foot to go to is something I am truly blessed for. 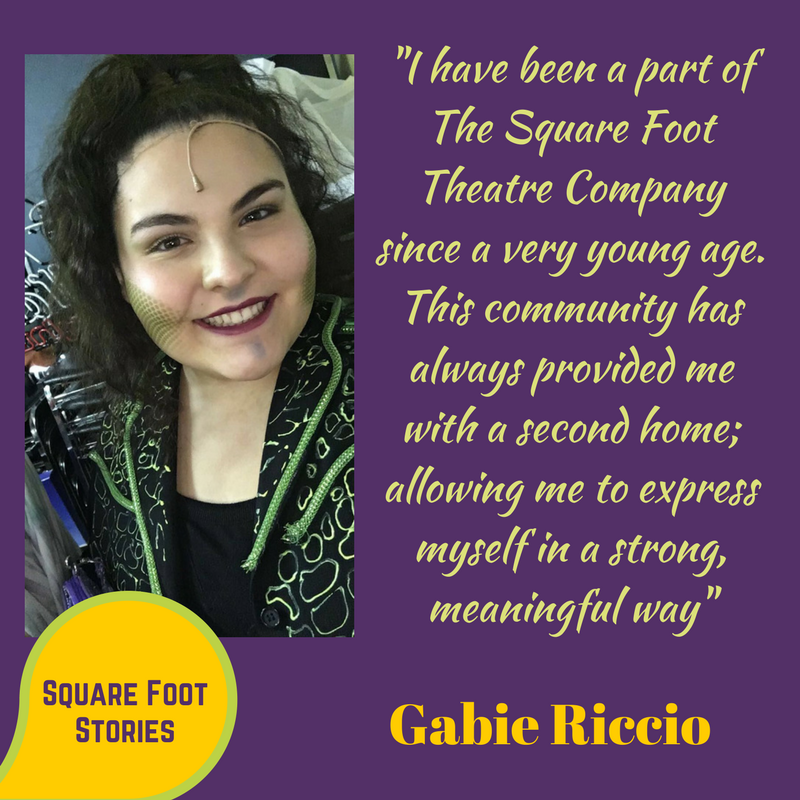 Square Foot Theatre is a place I am beyond thankful for, and I remain very glad that I continue to do shows there. "